i said i would be there, opening day, in line. and you better believe we were! (i wish i wish i wish i had a better looking photo of me. in fact we called some of our peeps and turned it into a down-right party. guess what i just warmed up for my lunch today? 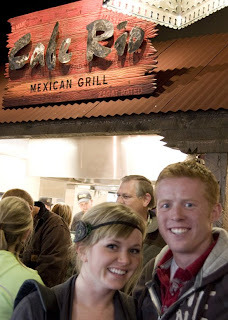 thanks a mil miss megan for bragging about your dinner at cafe rio. w/out the heads up we would have had the meatloaf i was making. I have never been but I'm going to ours next weekend!!! I just finished up my own little super-duper salad!! I swear they must put happy pills in it~ because when I eat it I just get so dang happy!! I just got home from work and warmed up my left overs!! I loved every bite of it :). Thanks for getting me there the day before grand opening. hooray for the dance class! i have been out of town and without internet and phone access! aahhh!! so this is the first time i've heard about your class! you will love it! i may be a little envious of you right now. i miss dance. have fun. do an extra leap for me, will you? 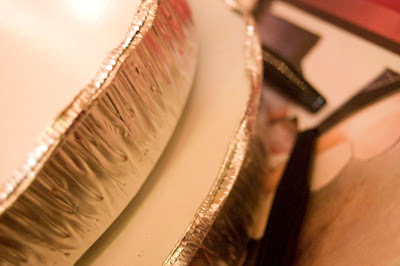 also, cafe rio rocks! love pork salad! can't wait to visit in i.f.!!! 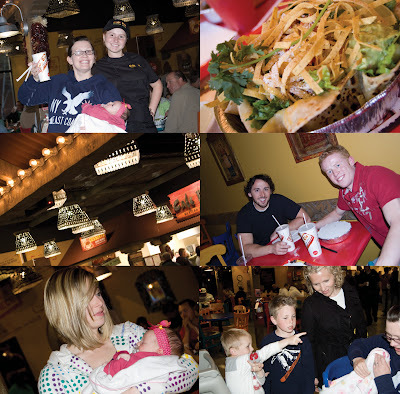 so i went there yesterday and the line was crazy long and i was too hungry to wait, so we went to bajio's! not as good, but it filled my craving for now!! That sounds good. I am a little jealous. I'm happy that they finally opened a cafe rio just for you. This way you won't always have to go to Utah :) Anyway, I am home now so lets get together. I was stalking on your blog and saw this CR post. I will always think of Audrey when I hit CR. That's a lovely pic of her and the waitress.